Water a necessity turned into a commodity, that many Capetonians cannot afford. The PHA Food & Farming Campaign [Philippi Horticultural Area] held a picket in Cape Town Thursday, 16 February 2017. They demanded that the Provincial Minister of Environmental Affairs and Development Planning, Anton Bredell, protect the PHA and the Cape Flats Aquifer [CFA] the famers water supply and the city’s future potable water. This demand is imperative, in light of a terrifying statistic that, since 16 February 2017, Cape Town dams are only 26% full, leaving the city with only 135 days of running water left. The demonstration took place at the 6 Spin Street Restaurant in Cape Town. An unusual place for a protest, 20 demonstrators stood right in the middle of the restaurant, between and around clients having lunch, causing them to become very uncomfortable. 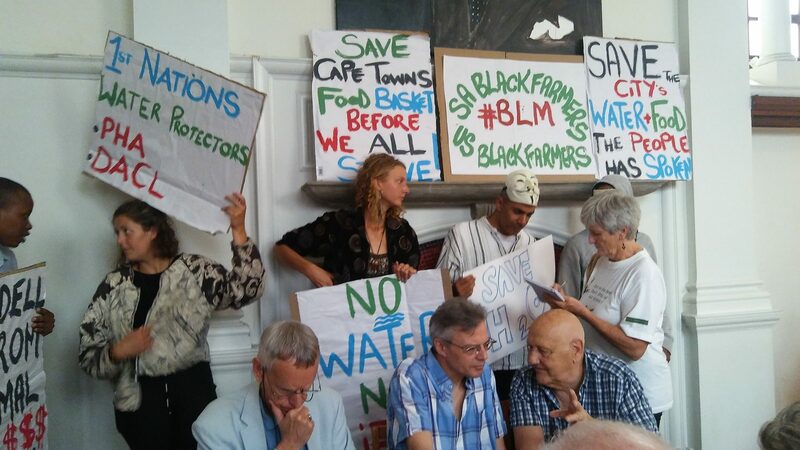 Ironically, they were gathered to listen to the Democratic Alliance MEC, Anton Bredell, speak to the question: where will Cape Town get its water from in the future? Not only were the poor out of sight, but clearly also out of mind as the DA in the Western Cape and the Western Cape Department of Environmental Affairs led by Bredell advocates for the development of desalination as the panacea to the city’s water problems. Bredell and Cape Town mayor Patricia De Lille are huge proponents of desalination, because it is in line with their view on development, which focuses on major projects and tenders. Desalination is the process of sanitising, cleaning and purifying sea/ocean water. 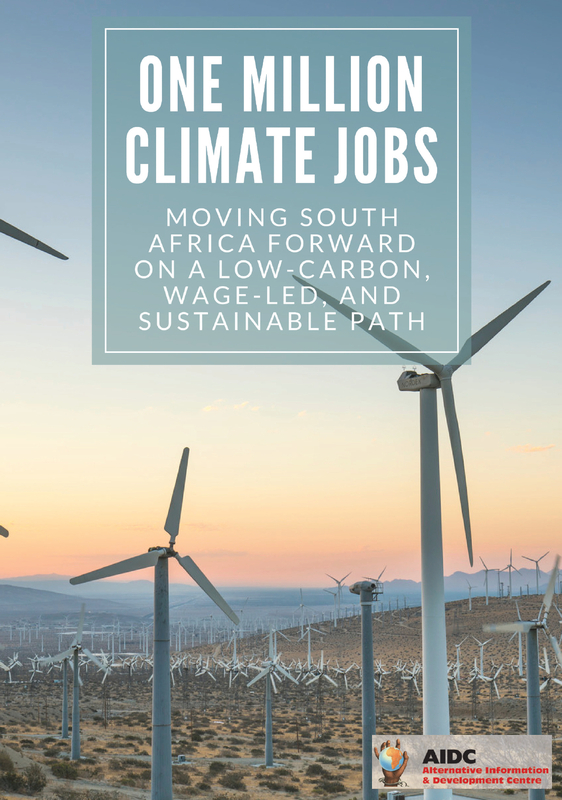 This clever process comes at a high cost, that will heavily impact on the poor of Cape Town. Nazeer Ahmed Sonday, coordinator of the PHA Campaign, stated that if farmers were to use desalinated water for irrigation it would result in an exponential increase in food prices. If the DA’s bid is successful, it would be easy to imagine a cabbage needing to be sold for R200 (approximately $15) each, just for farmers to cover the water costs. The poor are the ones who bear the cost. With many already without access to clean running water or food; desalination will only exacerbate the water crisis and food insecurity. The PHA Campaign is an important part of this. The Philippi Horticultural area produces 200 000 tons of vegetables per year, up to 80% of some vegetable types consumed in the city. The PHA farmlands is also the last remaining recharge zone of the Cape Flats Aquifer – an integrated underground water system. The aquifer holds enough fresh water to supply the city with 30% of its potable water needs almost immediately. It is essential for others to get involved, water and food impacts on everyone, not protecting water and food will lead to major crisis, for everyone. We cannot compartmentalise our struggles, because they are all interconnected. Hence, it is critical for us to unite all our struggles going forward in order to properly dismantle the system underlying the multiple crises we face today. The PHA Campaign also has a tour every Saturday morning – go and have a look. *Note: on the 8 of March, Amandla! Forums will be launching Tracy Ledger’s book “An Empty Plate”. Examining the battle for our food systems, how it matters, and how we can win it back. The events discussion will be facilitated by farmer and activist – Nazeer Ahmed Sonday (Coordinator of the PHA Food & Farming Campaign). 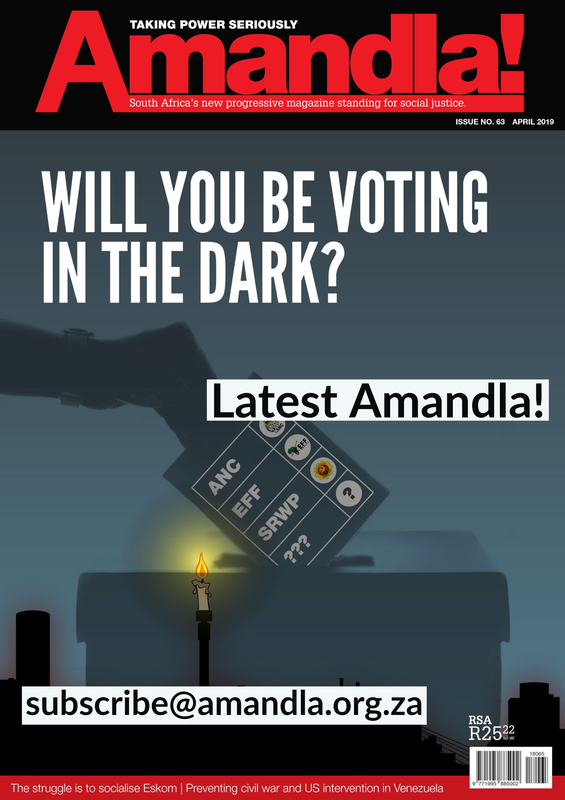 Email dominic@amandla.org.za for more information.